Quest Resources’ President, Kevin Ruane, was recently featured in an article on NerdWallet.com “10 Steps to Opening Your Own Hair Salon“. Kevin offers various insights into the planning stages of opening a salon business in this article along with other helpful tips. Limited Time Offer – No Payments for 90 Days! Upgrade your salon today and don’t worry about payments for 90 days. Get a head start on the new year, and reap the benefits of your upgraded salon, without worrying about the cost! This deferred payment program ends12/31/14. *Salons must be in business for 36 months and meet credit qualifications to participate in Deferred Payment Program. Jeff Grissler, one of the owners of Quest, realized a need in the Beauty Industry for a definitive guide to starting and remodeling a successful beauty salon. 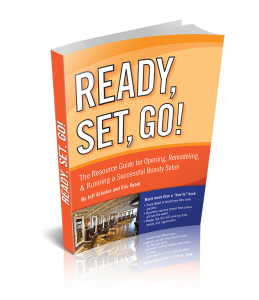 “Ready, Set, Go!” puts your dream of owning or remodeling a salon on the success track to learn operational tactics that would otherwise take years to master. Visualize, plan, and organize your new business venture. Assess and choose the right location and negotiate your lease. Design a salon that fits within your budget and set up a successful working relationship with your customers. And, everything else you need to own and operate a profitable salon. Fort Myers, FL (September 2nd, 2011) – Castleton Capital President and CEO, Kevin Ruane, today announced that his company has acquired Quest Resources from Grandview Financial. Quest Resources, originally founded by Kevin Ruane in 1987, is well known as the innovator of new approaches to equipment funding in the beauty industry. In 2004 Grandview Financial acquired Quest, but recently decided to exit this sector. This decision enabled Ruane, who had remained active in equipment funding especially in the tanning industry, to merge Quest Resources with his newer enterprise. “I am delighted to be back in the Salon and Spa business, it has been my passion for more than 20 years and I have many friends and colleagues still very involved in the industry. I am also pleased to be able to bring my former partner, Jeff Grissler, as well as my operations team back together again” said Ruane. Ruane will be President and CEO of the new Quest Group of companies: consisting of Castleton Capital Corporation Corp., Quest Resources USA and Castleton Capital Financial Solutions and its Divisions – Salon & Spa Division and Tanning Division. The Divisions offer a variety of financing products to meet the needs of qualified applicants: both start-ups and existing businesses seeking to remodel or expand their salons. Quest Resources has been directly involved in the salon & spa and tanning industires for over 20 years, financing more than $450 million to more than 15,000 businesses. Their significant and creative funding capacity, a proven track record and an experienced management team has helped them become the preferred funding source of major industry manufacturers, distributors and vendors such as Takara Belmont, Salon Centric, Sally’s Holdings, L’Oreal and Redken. Through its parent company Castleton Capital, Quest Resources has recently expanded its credit facilities and capital assets enabling its divisions to offer enhanced credit latitude and funding to a wide variety of businesses.